Mr. Speaker, I am honoured today to table a petition on behalf of constituents from my riding in London West. They call upon the Government of Canada to increase the amount of its childhood cancer research funding to 10%. They show concern towards the fact that childhood cancer is the leading cause of disease-related deaths among Canadian children. The petition contains signatories who have had their lives impacted by childhood cancer. I would like to thank the advocacy of Kim Vander Schelde, who helped collect these signatures. 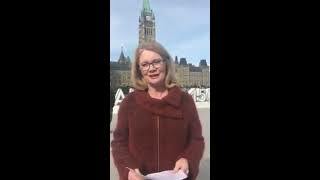 --- The Petition: We, the undersigned, residents of Canada, draw the attention of the House of Commons in Parliament assembled to the following: Currently less than 5 percent of Cancer research funding from the federal government is used towards childhood cancers. THEREFORE, the undersigned residents of Canada call upon the House of Commons in Parliament assembled to increase the amount of childhood cancer research funding be increased to 10 percent. Added April 8, 2019 from Kate Young, M.P..
Added February 1, 2019 from Kate Young, M.P..
Mr. Speaker, February is Heart Month. Heart disease affects approximately 2.4 million Canadian adults, and is the second leading cause of death in Canada. That is why organizations such as the Cardiac Arrhythmia Network of Canada, or CANet for short, are so important. CANet is based in London, and brings together healthcare professionals, academia, industry, not-for-profit, and patient input to support new ideas and ground-breaking research on arrhythmia and related heart conditions. I recently had the opportunity to visit CANet and see firsthand the work they are doing. Their research and first-of-its-kind technology will have significant impact not only on Canadians suffering from arrhythmias, but also on caregivers and for Canada’s healthcare system at large. I applaud CANet for its important work, and encourage all Members in this House to join me in raising awareness on cardiovascular health this month. Thank you, Mr. Speaker. 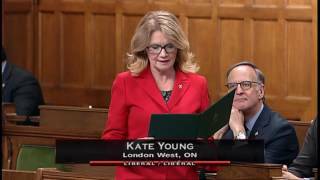 Added December 13, 2018 from Kate Young, M.P..
Mr. Speaker, For years, the Make-A-Wish Foundation has granted wishes to children with life-threatening medical conditions. Aiden Anderson is a 15 year old boy from my riding of London West and lives with a severe heart condition. Today, his wish is coming true. Aiden’s wish is to be Prime Minister for the day. He is here today with his family on Parliament Hill, and gets to experience a tour of Centre Block, dining at the Parliamentary Restaurant, holding his own press conference, and of course, meeting the Prime Minister of Canada. His strength, determination, and courage serve as an inspiration. He sets an example for all of us and demonstrates that no matter your age or the challenge you face, you can, and you will succeed. Congratulations Prime Minister for the day.. Aiden Anderson! Thank you, Mr. Speaker. 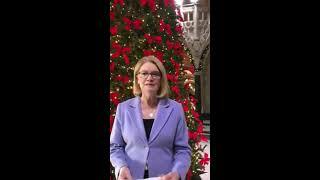 Added December 4, 2018 from Kate Young, M.P..
Mr. Speaker, Today is the United Nations’ International Day of Persons with Disabilities. This year’s theme, “Empowering persons with disabilities and ensuring inclusiveness and equality” is at the heart of the Government of Canada’s commitment to build a Canada without barriers. 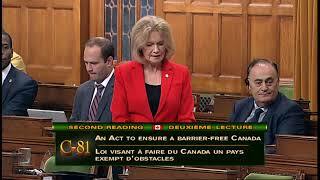 In June, our government introduced Bill C-81: the Accessible Canada Act, which, if passed, will address barriers to accessibility in the federal jurisdiction. 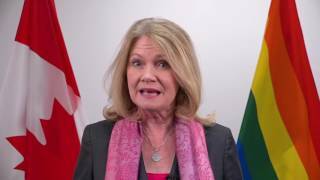 Earlier today, the Minister of Public Services and Procurement and Accessibility announced that Canada has acceded to the Optional Protocol to the UN’s Convention on the Rights of Persons with Disabilities. This means that Canadians will have additional recourse if they believe their rights under the Convention have been violated. These actions speak to our dedication to creating a truly inclusive and accessible Canada. Please join me in celebrating people with disabilities and the significant contribution they make to Canadian society. Thank you, Mr. Speaker. 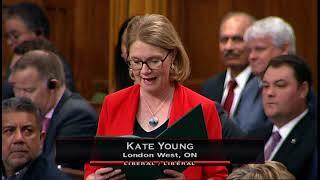 Added November 6, 2018 from Kate Young, M.P..
Mr. Speaker, our government is committed to creating a more inclusive, accessible and barrier-free Canada. That is why enhancing Canada Post's accessible delivery program is a key part of our government's renewed vision for the postal service. I am pleased to rise to inform the House that this week marks the first meetings of the Canada Post Accessibility Advisory Panel. This national advisory panel of experts and advocates for persons with disabilities and seniors will advise Canada Post on an enhanced accessible delivery program to make it easier for Canadians to access their mail and parcels. The Accessibility Advisory Panel will serve as a valuable forum for input and dialogue on the issue of accessibility. I thank these distinguished Canadians for agreeing to serve on the panel and for helping Canada Post continue to improve delivery for all Canadians. 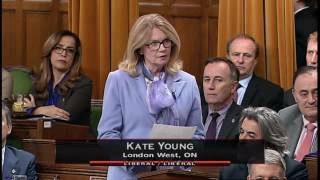 Added November 2, 2018 from Kate Young, M.P..
Mr. Speaker, Violence against women is a terrible and tragic reality… and its important to shine a light on this ongoing abuse of women and girls. This month marks the London Abused Women’s Centre’s 9th annual Shine the Light Campaign. The London Ontario organization offers abused and sexually exploited women and girls counseling, advocacy, and support in a safe setting. Their Shine the Light campaign aims to raise awareness of violence against women by turning communities purple for the month of November. Our government strongly supports gender equality, and condemns any type of violence against women. As Canadians, we need to do more to create a culture of non-violence and respect for women and girls. This month, let us stand in solidarity with victims, their families and loved ones, and recognize their courage and survival. Thank you, Mr. Speaker. 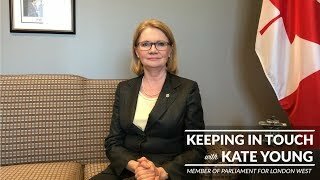 Added October 26, 2018 from Kate Young, M.P..
Mr. Speaker, Today is the first ever Brain Cancer Awareness Day in Canada. While we have made significant progress and advancements in various forms of cancer treatment, there is still much left to be done. That is why our government is undertaking a series of measures to modernize our healthcare system, so we’ll be in a better position to provide greater access to new treatments for diseases like brain cancer. With disease awareness, comes hope and support for research. I would like to recognize the Brain Tumour Foundation of Canada, a national non-profit organization based in London, Ontario. This week, they launched Hats for Hope, a nation-wide brain cancer awareness campaign calling on all Canadians to show support for increased brain cancer research. I extend my thoughts and support for all Canadians impacted by brain cancer. Together, we can make a difference. Thank you Mr. Speaker. I had the pleasure to rise in the house this week to recognize the 80th anniversary of the Turner Drug Store in Old South. 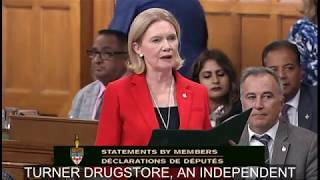 To owner Jeffrey Robb and the staff of the Turner Drug Store, I would like to wish you my sincerest congratulations for all the hardwork and community service you and your store have provided to Londoners over the past 80 years. 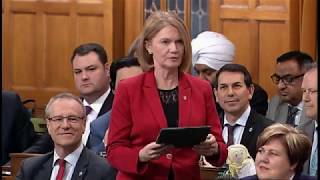 I had the honour of speaking before the House of Commons on Bill C-81, also known as the Accessible Canada Act. 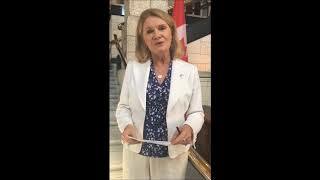 I spoke of the barriers that have affected my own family, but also the importance of enacting Canada's most extensive legislation for Accessibility and People with Disabilities. Together, we can help to eliminate not only the physical barriers hindering accessibility, but also the cultural prejudices currently affecting Canadians with disabilities. 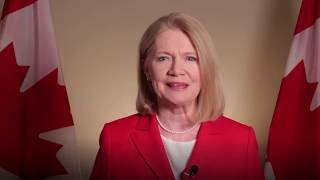 I would like to wish Canadians from across the country a safe and enjoyable Canada Day. As you celebrate this Canada Day, let us all take pride in everything that we have accomplished. To everyone in London West, I wish you a very happy Canada Day. 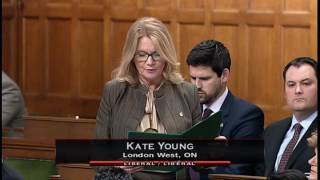 Added June 20, 2018 from Kate Young, M.P..
Monsieur le Président, j'ai le privilège de travailler en compagnie d'un groupe de jeunes brillants et inspirants au sein du Conseil jeunesse de London-Ouest. [TRANSLATION] Mister Speaker, I have the privilege in working with a group of brilliant and inspiring young people as part of the London West Youth Council They volunteered their time collecting non-perishable food items for Innova, an organization that provides shelter for abused women and their children. They filled 23 large bags with breakfast items, which were then delivered. I am excited to continue to work with my youth council, and to show them that there are many ways to be leaders of today. Leur passion et leurs compétences m'inspirent, tout comme le changement positif qu'ils apportent à notre communauté. Merci Monsieur le Président. [TRANSLATION] Their passion and their competency inspire me, as does the positive change they make in our community. Thank you Mister Speaker. 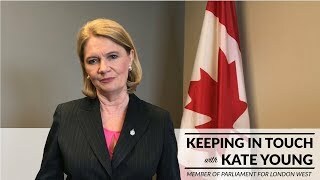 Added May 28, 2018 from Kate Young, M.P.. 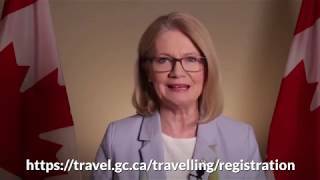 This May 27th to June 2nd is National AccessAbility Week, a week meant to help raise awareness and help support people with disabilities and their families across Canada. AccessAbility Week is also a great time to further shed light on the importance of inclusion and accessibility in our communities and workplaces across the country. I encourage each and every one of you to take time to highlight the valuable contributions people with disabilities make in your communities and workplaces. The Government of Canada is taking critical steps by introducing accessibility legislation that will help eliminate barriers people with disabilities still face in areas under federal jurisdiction. 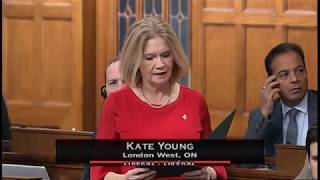 Added May 14, 2018 from Kate Young, M.P..
Added May 11, 2018 from Kate Young, M.P.. This week, for Mental Health Week, we encourage Canadians to get loud for mental health – to talk freely and openly about what mental health means to them, and making sure those struggling with mental health issues know they are not alone. Also this week is National Nurses Week. 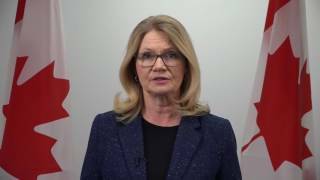 The week is a reminder to Canadians to honour the hard work and dedication of Canada’s 421,000 nurses as they do their part in keeping our nation healthy. To the nurses across London, I thank you for all your hard work. Added May 7, 2018 from Kate Young, M.P..
Last week, Dr. Jason Gerhard and Leanne Grieves from Western University were among the scientists honoured at Rideau Hall for the Natural Sciences and Engineering Research Council's (NSERC) Award. The NSERC Awards recognize the outstanding contributions made by Canadian scientists to international science and technology. Congratulations to Jason and Leeane! 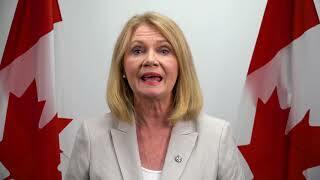 Added May 4, 2018 from Kate Young, M.P..
Mr. Speaker, Today I rise to acknowledge Beverly Thomson, a London West resident and recipient of the Governor General’s Sovereign Medal for Volunteers. As an official Canadian Honour, the Medal for Volunteers recognizes the exceptional volunteer achievements of Canadians from across the country. 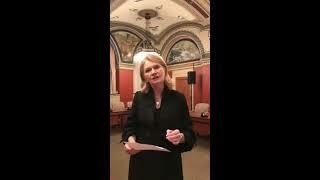 Beverly Thomson has spent many years helping those suffering from alcohol and drug addiction. She was a founding member of Westover Treatment Centre in Thamesville and Executive Director of St. Stephens, a recovery home for men in London. After decades of devotion to get local and affordable treatment programs in place for people battling alcohol and drug dependency, Bev Thomson is still championing addiction awareness today. Thank you Beverly for the lives that you have touched, and for all that you have done for Southwestern Ontario. Your selflessness and dedication to service is truly an inspiration Thank you, Mr. Speaker. 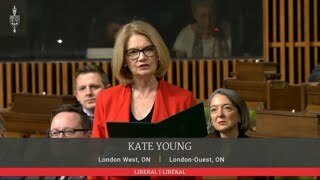 Added May 1, 2018 from Kate Young, M.P.. This week we make a quick visit to the Library of Parliament, and discuss its historic place on Parliament Hill. 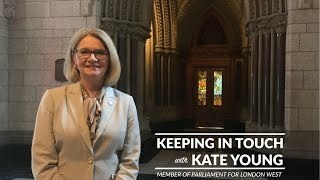 If you would like more information on visiting Parliament Hill, visit my website at kateyoungmp.ca or email kate.young@parl.gc.ca. 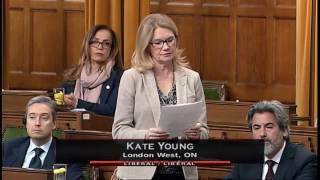 Added April 20, 2018 from Kate Young, M.P.. 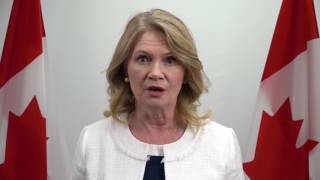 In honour of National Volunteer Week, I share two stories of volunteerism from London, and let you in on how you can recognize those who volunteer in their communities by nominating them for the Canada's Volunteer Award. Let's all do our part, and help make our communities and the world a better place. Added March 29, 2018 from Kate Young, M.P..
Mr. Speaker, today, I would like to take the time to congratulate Wyn Geleynse on being a recipient of the 2018 Governor General's Award in Visual and Media Arts. These awards celebrate the remarkable careers of individuals in the Canadian visual and media arts community. Wyn Geleynse is a London, Ontario artist whose work provokes, questions, and investigates the nature of our humanity. His work has been exhibited widely in Canada, the United States, and Europe, and will be on exhibition at the National Gallery of Canada beginning today. His is an incredible, 40-year long career that deserves to be known and appreciated. I applaud Wyn Geleynse for being one of the eight recipients this year receiving this prestigious award. I know his work will continue to engage and inspire audiences around the world. 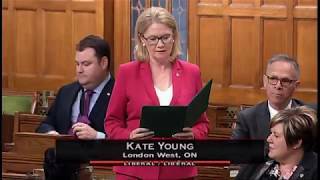 Added March 22, 2018 from Kate Young, M.P.. 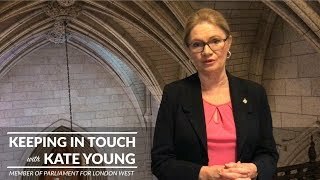 This week, my video recounts the steps our government has taken to improve the health and well-being of seniors in London West. Added March 21, 2018 from Kate Young, M.P..
March 21st is World Down Syndrome Day. To commemorate and raise awareness of our Down Syndrome community, many people are wearing odd socks. Go ahead, wear odd socks today! 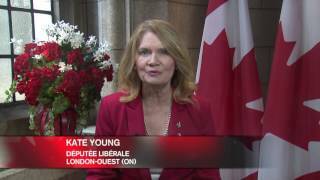 Added February 15, 2018 from Kate Young, M.P.. This week, I'm joined by my friend and colleague Terry Duguid, the Parliamentary Secretary for Status of Women. 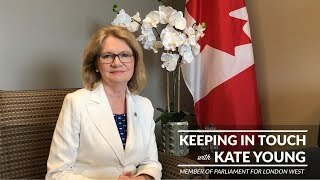 Terry and I sat down to discuss gender equality and women empowerment, the steps our government is taking to combat gender-based violence, and the importance of encouraging young women and girls to pursue opportunities outside traditional fields. 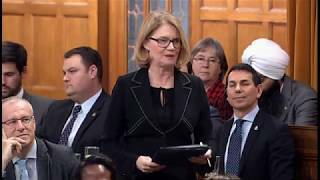 Added February 14, 2018 from Kate Young, M.P..
On behalf of the Honourable Minister of Science Kirsty Duncan, I respond to a question from Liberal MP Jean Yip of Scarborough-Agincourt about how Canada is investing in Artificial Intelligence. 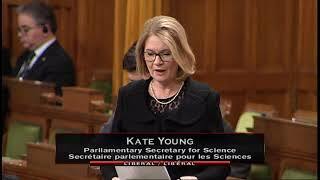 Added February 12, 2018 from Kate Young, M.P..
On February 12th, I spoke before the House of Commons in celebration of International Day of Women and Girls in Science. I also took a moment to recognize the efforts of Let's Talk Science, an organization based in London devoted to promoting STEM in the lives of Canada's Youth. 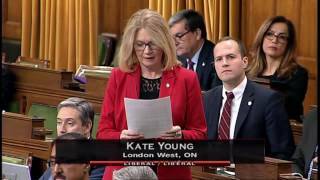 Added February 8, 2018 from Kate Young, M.P.. This week I'm joined with the Honourable Parliamentary Secretary for the Minister of Sport and Persons with Disabilities, Stéphane Lauzon. 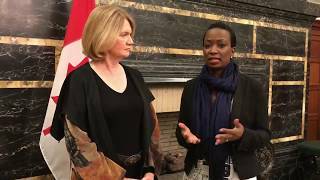 This week I'm joined with the Honourable Parliamentary Secretary to the Minister of International Development, Celina Caesar-Chavannes. Together, we discuss the importance of Black History Month in Canada. 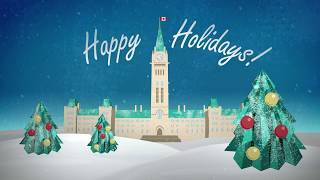 Added December 8, 2017 from Kate Young, M.P..
Hey London West, here's what I have been up to in Ottawa and the riding this past week! 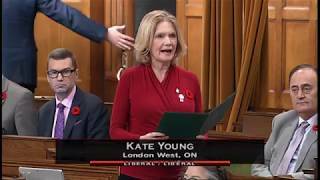 Added November 21, 2017 from Kate Young, M.P..
Added November 9, 2017 from Kate Young, M.P..
Added October 26, 2017 from Kate Young, M.P..
Mr. Speaker, I rise in the House today to pay my respects to Ms. Daphne Caruana Galizia, the Maltese journalist whose life was tragically cut short yesterday when a bomb exploded in her car shortly after she left her home. Ms. Caruana Galizia bravely investigated corruption and organised crime in Malta. We unequivocally condemn this barbaric attack we express our deepest sympathy to her family, and to all those affected by her tragic death. We must continue to support journalists from around the world in their pursuit of the truth and the preservation of the fourth estate. As a former journalist, I praise Ms. Galizia’s dedication to truth, and call upon my colleagues in this House to stand united against this horrific attack. Thank you, Mr. Speaker. 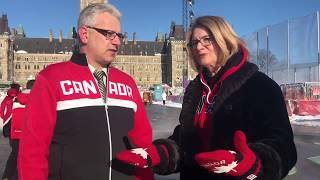 Hey London West, here's what I have been up to in Ottawa and the riding these past two weeks! 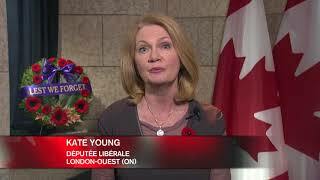 Added August 28, 2017 from Kate Young, M.P..
Added June 21, 2017 from Kate Young, M.P..
Added June 1, 2017 from Kate Young, M.P..
Added April 12, 2017 from Kate Young, M.P..
Added February 21, 2017 from Kate Young, M.P..
Added February 13, 2017 from Kate Young, M.P..
Added January 10, 2017 from Kate Young, M.P..
Added December 13, 2016 from Kate Young, M.P..
Added November 18, 2016 from Kate Young, M.P..
Added November 15, 2016 from Kate Young, M.P..